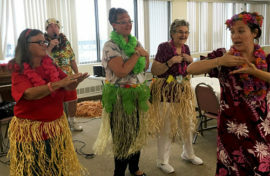 New Bedford, MA (September 16, 2016) – More than 30 residents of Melville Towers –a community of 320 apartment homes managed by full-service real estate firm Peabody Properties, Inc. in New Bedford – recently celebrated the end of summer with The Big Kahuna Musical Interactive Tropical Luau Show. Funded by MassHousing’s Tenant Assistance Program (TAP), The Big Kahuna party featured Hawaiian themed activities including Hula lessons, a limbo contest and live music. Pictured above (left to right): Deborah Costa, Melville Towers resident; Scott Severance, Big Smile Entertainment performer; Pamela R. McCombs, Melville Towers Assistant Property Manager; Dora Cloutier, Melville Towers resident; and Jennifer Shimmel, Big Smile Entertainment performer.